It is often said that one of the hardest things in life is figuring out which bridges to burn, and which to cross. Sometimes, the bridges we burn light our way, other times, the bridges we burn are the same ones we need in the future. For TEDWomen 2017, we’ll explore the theme of Bridges – Building them, burning them, walking them, and being them. TEDWomen is a three-day conference about the power of women and girls to be creators and change-makers. 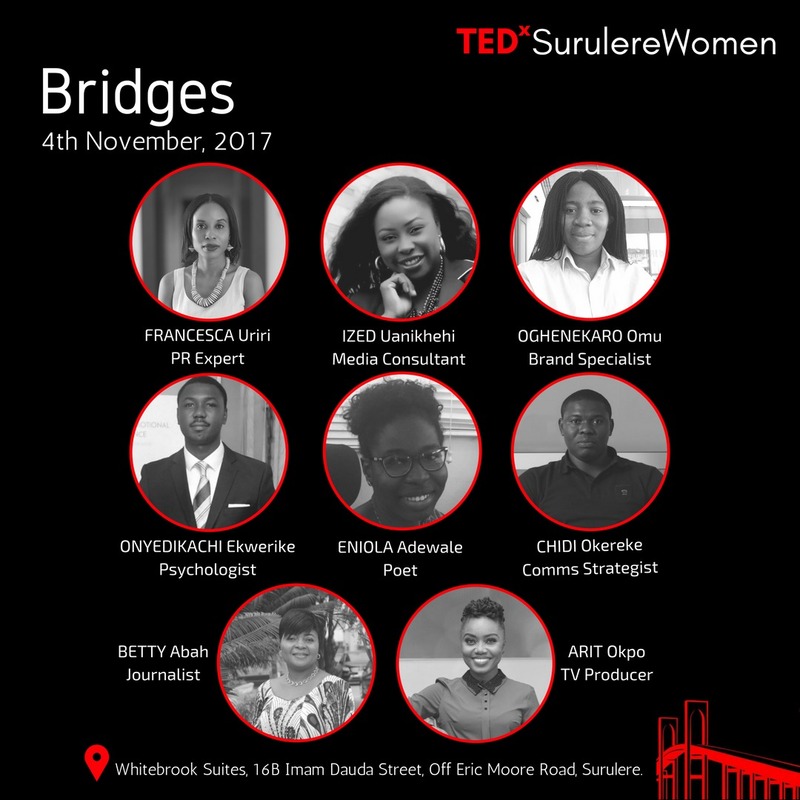 TEDxSurulereWomen is an independently organized TED event which will hold in Surulere, Lagos. The event will feature a curated lineup of diverse speakers spanning industry, origin, age and experience. It will also feature a selection of exclusive simulcast segments of the TEDWomen event taking place in New Orleans only 24 hours prior. The goal of this event is to help people connect in an environment that inspires the expression of unique points of view as we explore the theme in all its manifestations in relation to gender and society at large. Some of our speakers are Betty Abah; Founder and Executive Director of CEE HOPE, a girl-child rights and development non-profit organization based in Lagos, Arit Okpo; A Writer, Producer and Presenter at EbonyLifeTV. Karo Omu – Founder of Sanitary Aid For Nigerian Girls, Fransesca Uriri – Founder of Leading Ladies Africa, Ized Uanikhehi – Founder, EvolveSynergy and Kachi Ekwerike – Founder, PostPartum Support Network and Chidi Okereke, Entrepreneur and Digital Communications Strategist. TEDxSurulereWomen is a free event but registration is required. Please register here and visit our social media pages @tedxsurulere to see more details. Where: WhiteBrook Suites16B, Imam Dauda Street, Off Eric Moore Road, Surulere. When: 4th of November By 9am. For sponsorship and partnership details, send an email to motunrayo@tedxsurulere.com or call 08020879102.